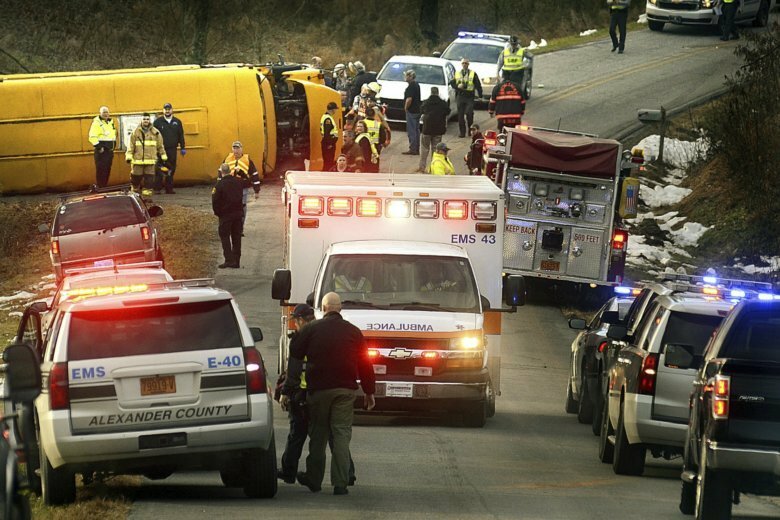 TAYLORSVILLE, N.C. (AP) — A North Carolina school bus overturned after it was hit by a car on Monday, sending 13 middle school students to the hospital. Twelve of the students had minor injuries in the crash in Alexander County, while one was in critical condition but expected to survive, according to a news release by the North Carolina Highway Patrol. The drivers of the bus and car were also hurt. Master Trooper Jeffrey Swagger said the crash happened near West Alexander Middle School when the car crossed the center line and hit the bus carrying a driver and 19 students. “The bus continued off the roadway and overturned,” he said in the release. Six of the children weren’t injured and made it to school after exiting through the bus emergency door. The Highway Patrol said the driver of the car, 56-year-old Kimberly Ann Austin of Taylorsville, was charged with driving while impaired and driving left of center. She was being treated Monday afternoon at a hospital. It wasn’t clear if she had a lawyer who could speak for her. A working home phone listing couldn’t be found, and the district attorney’s office didn’t immediately respond to an email asking if Austin has an attorney. In a separate accident Monday, news outlets report a bus driver from Rowan County died after suffering an apparent medical condition while driving. No children on the bus were hurt.